The first two years of elementary school are a wonderful time. Students learn independence, begin to build a love of learning, and meet new classmates and friends. At Ravenswood, we use a practice called Looping. Students stay in the same classroom, with the same children and same teacher, for both kindergarten and first grade. We believe this helps our students build confidence and a sense of security. It also helps to strengthen friendships and initiate a strong sense of community. You’ll find information on all of our kindergarten and first grade plans below. Please scroll down, or click on a link, to learn more. Students work in small groups within each classroom. Our K-1 classrooms each have their own library, and students can pick their favorite books during reading time. Art is integrated into all of our classes - though some of our favorite portraits come from our K-1 students! Students study science and social studies in K-1, using our inquiry-based learning approach. At Ravenswood, we believe purposeful play is a powerful tool all children need to be successful, both in and out of the classroom. It gives children the chance to experiment and understand the world around them without being directly instructed by an adult. Children develop skills to interact with others, regulate their emotions, and build independence and confidence in themselves. Much like a reading or writing workshop, students are instructed as a whole group, given time to practice newly learned skills, and then share about their experience. Balanced Literacy is an approach to teaching that exposes children to reading and writing through a wide variety of experiences. This highly effective framework for literacy instruction allows children to take ownership of and interest in their learning. 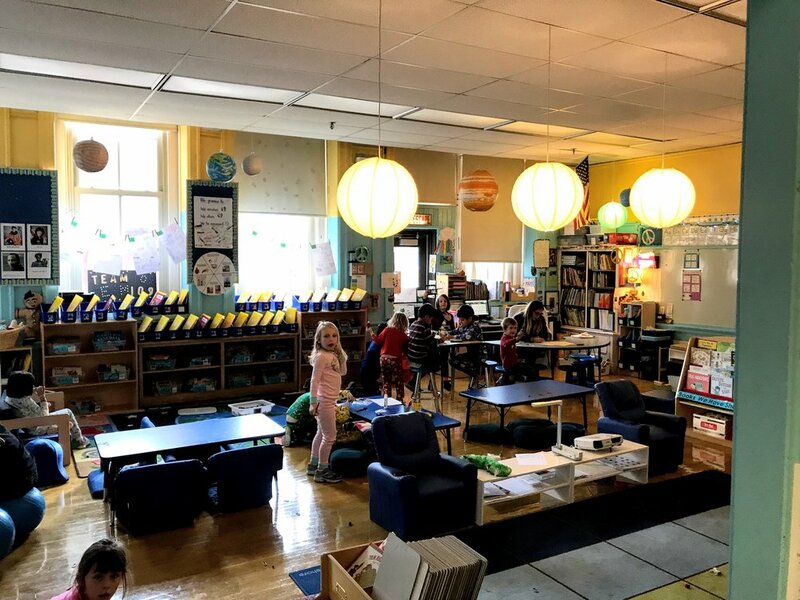 As members of balanced literacy classrooms, the children will participate in activities (e.g., guided reading, interactive read aloud, writing workshop, etc.) that will increase their skill level while fostering their interest in and love of reading and writing everyday. Much of our instruction follows the workshop model. With this model, we will be teaching lessons, providing time for the children to work independently and with partners, and then wrapping lessons up with share time. Ravenswood uses Everyday Math from pre-k through fourth grade. This curriculum revisits concepts multiple times throughout the year and in between the years. This approach can seem different than a more traditional model in which math concepts are taught to mastery. Everyday Math exposes students to concepts over time to deepen understanding. At Ravenswood, we use an Inquiry-based model to investigate science and social science concepts. Students are given ownership over learning as we guide them through the skills necessary to research independently. These include asking meaningful questions, researching a topic, and presenting new information to a wider audience. Students are also explicitly taught how to collaborate with peers in this learning process. First grade students work in independent study - and enjoy Pajama Day! Students bundle up for dismissal. We encourage families to practice putting on boots, hats, gloves and coats at home, to make this process as smooth as possible! 8:45 – 9:00am - Breakfast and welcome activities. 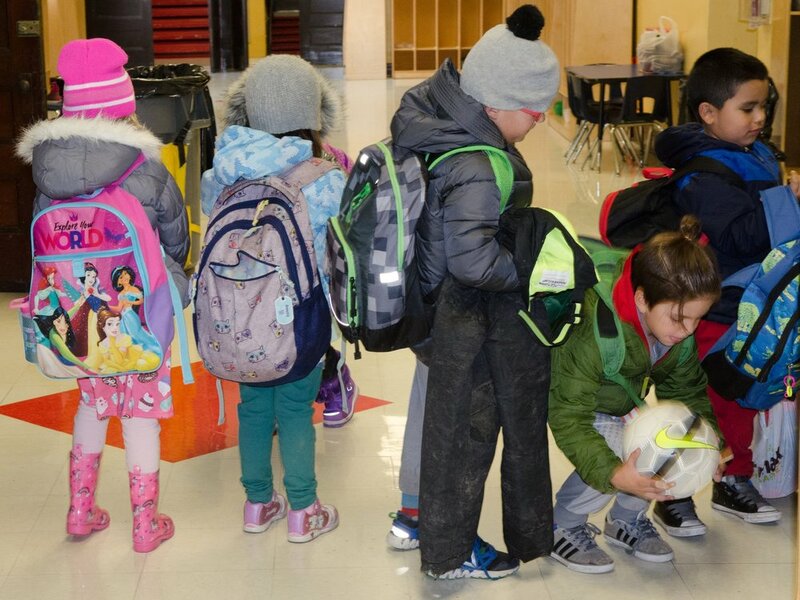 Our school is part of the universal breakfast program, which means that there’s always a grab-bag breakfast waiting for any child who wants one. Students don’t have to sign up; they can just grab a breakfast on their way into school. The first ten minutes of day are designated as breakfast time for the children who wish to participate. 9:00 – 9:30am - Morning Meeting. Teachers will share any general updates, and students may take turns sharing exciting news or stories. 11:45 – 12:40pm - Lunch & Recess. Students may bring a lunch (please see our nut-free guidelines) or get a free hot lunch from the cafeteria. 2:40 – 3:40pm - Enrichment Classes (Dance, Drama, Art, PE). 3:45pm - Dismissal. We use thoughtful safety policies for dismissal to ensure that each student goes home with an approved parent or guardian, or is walked safely to after-school programming. We have a designated snack time in our day. We want all of the kids to have the mental and physical energy they need to get through our long day, so we’re asking that you send your child to school with a healthy snack every single day. We will take a class bathroom break before lunch every day. Please make sure your child uses the washroom right before school each day to avoid morning trips to the bathroom. If we start to notice a pattern with your child having to go frequently we will let you know so we can problem-solve together. Some children can be nervous about using the bathroom at school, particularly in kindergarten. Please have a conversation (or repeated conversations, if necessary) with your child about asking his/her teacher whenever s/he needs to use the washroom. Using and demonstrating social emotional skills: + (Consistently) ✔ (Sometimes), and - (Rarely). The Board of Education requires letter grades for all students beginning in first grade. At this age, children are still developing at different rates and have varying abilities. We will not be discussing grades with the children in any of the classrooms or showing them their report cards. We strongly recommend that you also don’t discuss grading or the report card with your child. Report cards will be distributed at the end of each 10-week quarter. We firmly believe in the importance of play and family time for our young learners. Knowing that time at home is limited, we ask that you spend the family time that you do have engaging in activities such as reading together, having meaningful conversations, and playing. We are confident that the amount of time the children spend on academics during the school day is sufficient, and that they’ll be very well prepared for the following grade by the end of the year. We do not assign homework in Kindergarten or first grade. In first grade, Everyday Math Homelinks will be sent home regularly throughout the year. Please understand that these are not worksheets for the children to fill out on their own! As the name suggests, they are intended to serve as links from school to home, and as a way to keep you involved with your child’s math learning. These are not required to be completed in any amount of time and do not ever need to be turned in. If your child completes the Homelinks in BASA, we highly recommend that you find time to review them at home and provide extra practice if necessary. We will learn a new poem and/or song each week. The poems will be a way for us to build community as well as work on various reading skills. The first graders will create poetry journals where they will collect and illustrate all of the poems. We will also send a copy of the poem home in the daily folders each week. We recommend helping your child to create a system (a folder/notebook/binder, etc.) for saving and storing the poems. They are a great way for the kids to work on reading fluency and various other reading skills at home. We do ask that your child spends time reading every night. This can happen in a variety of ways, including reading independently, reading to you, and, most importantly, being read to by you. All of these types of reading are extremely valuable, so please try to do a variety. Students spend time getting to know each other during the first few weeks of kindergarten. Our looping program for kindergarten and first grade ensures students remain with their classmates and teachers for their first two years, building strong relationships. We welcome all parents, guardians and family of kindergarten and first graders to join our classroom community! You can join us in a variety of ways. If you’re on Facebook, please join our Kindergarten Facebook page or our First Grade Facebook Page. You’ll find playdate and party invites, discussions, and questions posted here. Please note that these are closed Facebook groups, so conversations are private, and we will ask you to confirm your student’s name. We always need help getting organized, and always need volunteers for recess. You can sign up to help with those here. Please note that, per CPS policy, you do need to be a registered volunteer. We take 2-4 field trips a year in Kindergarten and 1st grade. We’ll send permission slips and information forms home in your student’s folder 2-3 weeks before the field trip. We’ll also send updates via our regular emails and through your room parents. 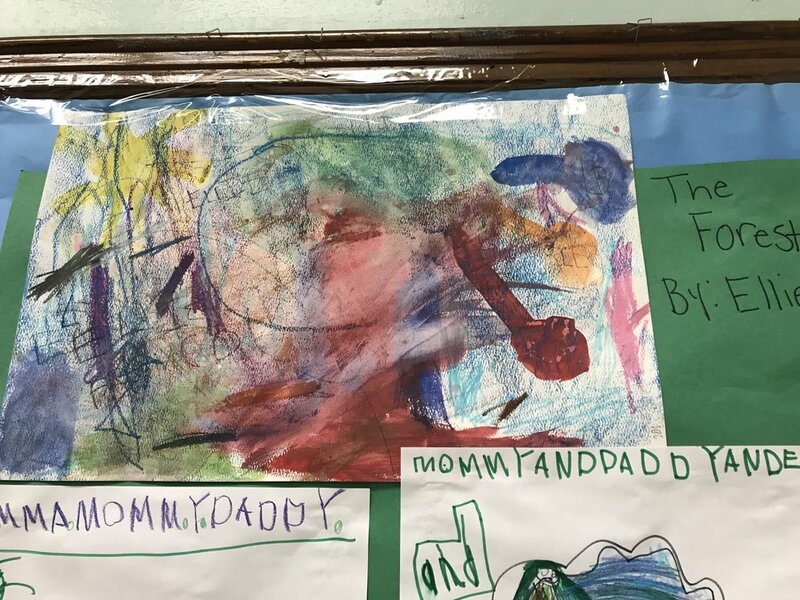 Parents and families are a frequent subject of our students’ work. Our teachers send regular email communications. We’ll send notes daily in Kindergarten to let you know what’s happening every day in class, and suggesting questions for you to ask your child about their school day. We send monthly newsletters in first grade with updates on our curriculum, new projects, and classroom favorite activities. Your child will have a folder that will need to go back and forth every day. Please make sure to empty the folder every single night! You can send notes back to the teacher in the morning. Our Kindergarten & 1st Grade Handbook, which we sent home at the beginning of the year, provides an overview of our classrooms that you can refer to at any time, and you’re always welcome to reach out to our teachers any time.